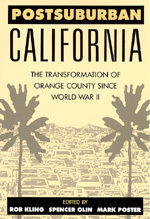 Neither a city nor a traditional suburb, Orange County, California represents a striking example of a new kind of social formation. This multidisciplinary volume offers a cogent case study of the "postsuburban" phenomenon. Rob Kling is Professor in the Program in Information and Computer Science, the Graduate School of Management, and the Public Policy Research Organization at the University of California, Irvine. Spencer Olin is Professor of History and Mark Poster is Professor of History, both at the University of California, Irvine.